A low-cost, paper-based diagnostic could reduce spread of the Zika virus by revolutionizing the ease, speed and accuracy of its diagnosis in the clinic or in the field. The Zika test, developed by a team of researchers led by synthetic biologist James Collins, Ph.D., at Harvard University’s Wyss Institute for Biologically Inspired Engineering, has been named a 2016 “Best of What’s New” awards winner by Popular Science magazine in the Health category. The “Best of What’s New”, currently in its 29th year, annually honors 100 revolutionary products and technologies that are transforming the world across a range of award categories: Aerospace, Auto, Engineering, Entertainment, Gadgets, General Innovation, Health, Home, Recreation, Security, and Software. The “Best of What’s New” Health category, in which the Zika test technology is a winner, recognizes medical treatments and devices that could “solve an unsolvable problem” and utilize entirely new ideas and functions. To build the Zika test, Collins brought together a team including Wyss Institute scientists as well as collaborators from MIT, the Broad Institute of Harvard and MIT, Harvard Medical School (HMS), University of Toronto, Arizona State University (ASU), University of Wisconsin-Madison (UW-Madison), Boston University (BU), Cornell University, and Addgene. They envisioned a new class of diagnostic that is inexpensive and rapidly deployable to screen blood, urine, or saliva samples for Zika or any other RNA virus including Ebola, SARS, measles, influenza, hepatitis C, and West Nile fever. With that goal in mind, Collins’ team has developed a diagnostic system that does not require refrigeration or electricity. They freeze-dry synthetic gene circuits onto paper discs. 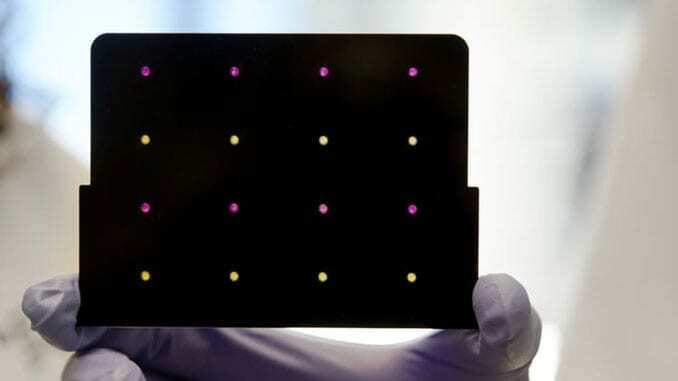 These biomolecular circuits are activated when the paper is rehydrated with a droplet of sample fluid; the disc changes color to indicate a positive result for Zika virus, similar to the visual readout of a home pregnancy test. To validate their rapid Zika test, the team successfully identified strain-specific Zika in blood samples from infected monkeys as well in laboratory cell cultures infected with the virus. More recently, working with collaborators in Ecuador, the test has been used to accurately diagnose presence of Zika virus in patient samples. The ability to discern between strains of Zika is especially important for diagnosing the American strain of the virus, which is associated with rare but severe neurological symptoms including fetal microcephaly and Guillain-Barre´ syndrome. The “Best of What’s New” judging criteria include the significance of the innovation, the quality of the design and its originality, and the ambition and scope of the project. “The cell-free, paper-based tests developed by Jim Collins and his team provide a low-cost, stable platform for long-term storage and fast deployment of diagnostics, anywhere in the world, where they can rapidly diagnose the presence and identity of rapidly emerging viral pathogens. It is fantastic to have yet another recognition for the team’s transformative work,” said Wyss Institute Founding Director Donald Ingber, M.D., Ph.D.